I mentioned in my previous article, a review of the R-Go Tools vertical mouse, that I actually received two products from R-Go Tools. The other product was a very interesting ergonomic keyboard, the R-Go Split. The Split gets its name from the fact that it is a split keyboard (for more information on the different types of ergonomic keyboard make sure to check out our Ergonomic Keyboard Buying Guide). 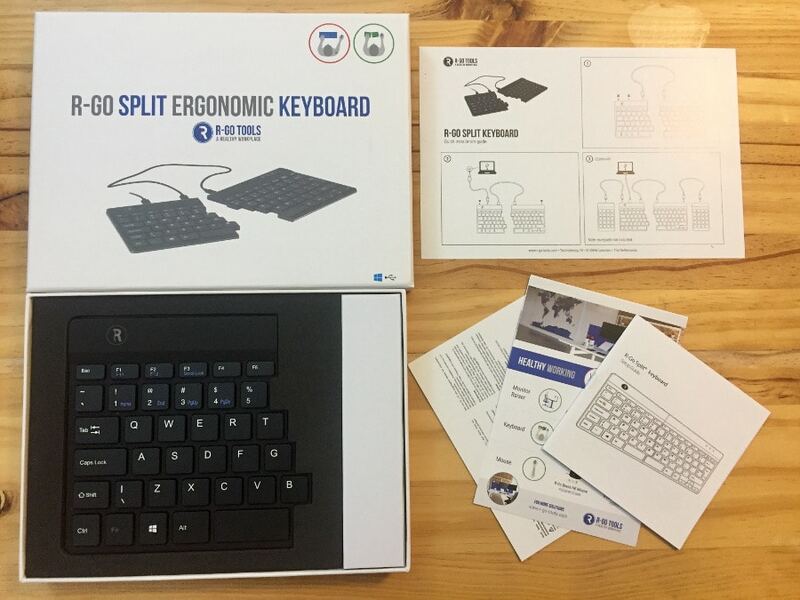 This split keyboard is the first of its kind that I’ve personally used, and from my testing and use over the past weeks – I can say that it certainly a step up from using the basic laptop keyboard that I have on my Mac. It is small and lightweight, fantastic for travel or even just to take to and from work each day. Most importantly, as someone who has wrist injuries and often gets pain from prolonged mouse and keyboard use, the R-Go Split enables me to work in a more ergonomic position – this helps a lot on those days when I’m typing for hours on end. There is a small learning curve getting used to the shape and design, but once your past that, I can assure you that there will be no looking back! 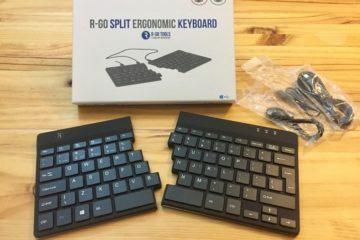 Should I use a split keyboard? We have discussed before the most common wrist injuries in the office, as well as how to avoid them. We also have mentioned in our keyboard buying guide the different types of keyboards and why you should use one style or another. 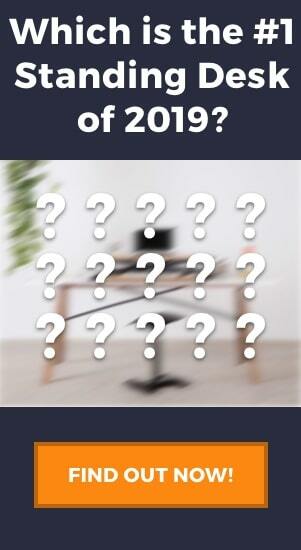 I would like to cover these topics once again here just to truly cover why a split keyboard is a great option for an ergonomic keyboard – and why a split keyboard could be what you need to alleviate pain experienced in the office. Firstly, I should point out that no all ergonomic keyboards are split keyboards, nor are all split keyboards necessarily ergonomic. 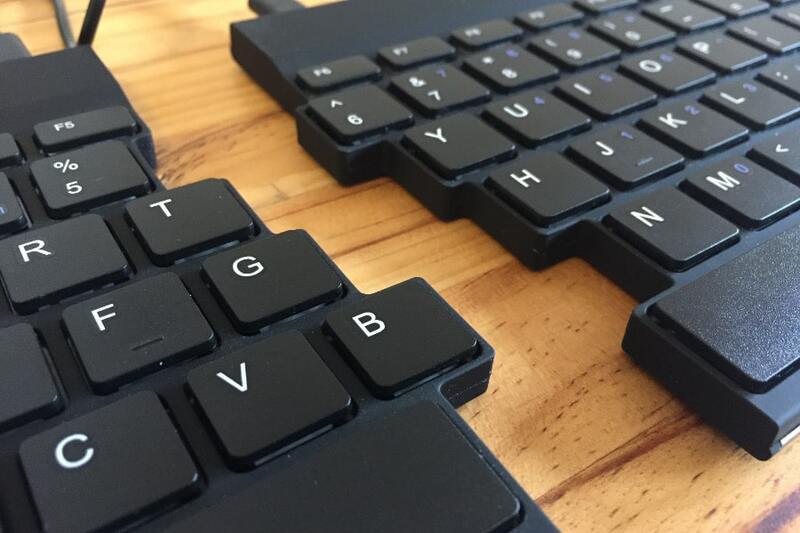 A true ergonomic split keyboard such as the R-Go Split has some very key benefits. 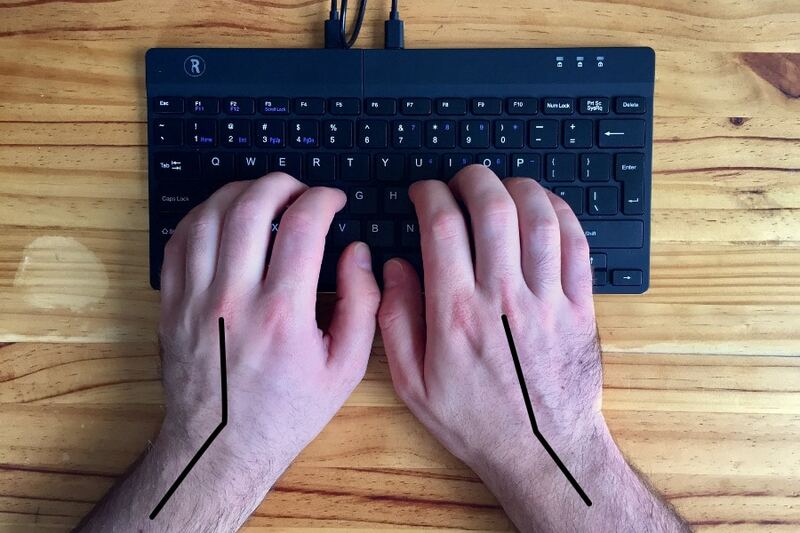 When using a standard sized keyboard, generally both these movements are accentuated, and if you are a bigger person like me with relatively broad shoulders the problem is only made worse. Most keyboards are small an will only measure 10′ – 12′ across. This forces you to have your hands close together which internally rotates the shoulders (a common cause of rounded shoulders and poor posture), and since the keyboard is straight you will have to bend your wrists outwards to type the keys correctly. The split when together is about the same size as a laptp keyboard, and you can see the angle that my wrists are forced into in order to type on a keyboard this size. With the R-Go Split, I have two main options which allow me to type in a far more comfortable position. Firstly, can spread the two pieces a much further distance (in fact, the maximum width from edge to edge is around 20′). Secondly, I can rotate the two pieces so that I do not need to pronate my wrists. you can see in the image below how this improves my wrist position. Splitting the two pieces and rotating them inwards removes a lot of stress from my wrists. Like the vertical mouse, the Split Keyboard comes very well packaged in a sturdy cardboard box. It was extremely secure and each piece came well protected, the cables in separate bags, and everything in top condition. Getting set up was really easy and the instructions are very clear. Connect the two pieces with the small cable into the ports that are both near the center of the keyboard. The connect the keyboard to the computer via the next closest post on the left side. Finally, there are two empty ports on the left and right and one extra cable. I don’t have one, but this is where you can attach a number keypad as an add-on. All plugged in and the light tells me i am ready to go! This is largely what I covered in the section before – but it is really worth repeating! 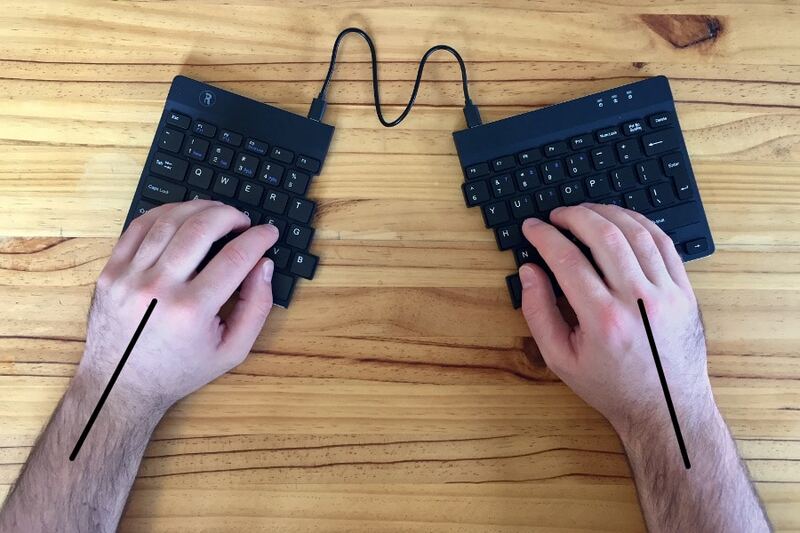 A split keyboard such as the R-Go Split will allow you to work in a far more comfortable and ergonomic position which will ultimately reduce stress on your wrists and save you from long term injuries such as Carpal Tunnel. Not only this but the Split also has a super low profile. 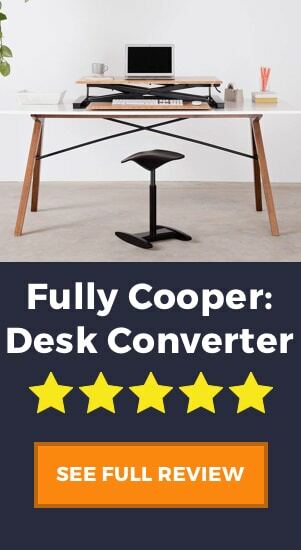 unlike many keyboards which are thicker and often angled/titled upwards, the Split is perfectly flat and low to the desk. This means that you will not be overextending your wrists while you use it. A big part of the comfort and usability of a keyboard are the keys. You’ll often find that with many external keyboards, especially the thin, low-profile ones like this, the keys are very soft. 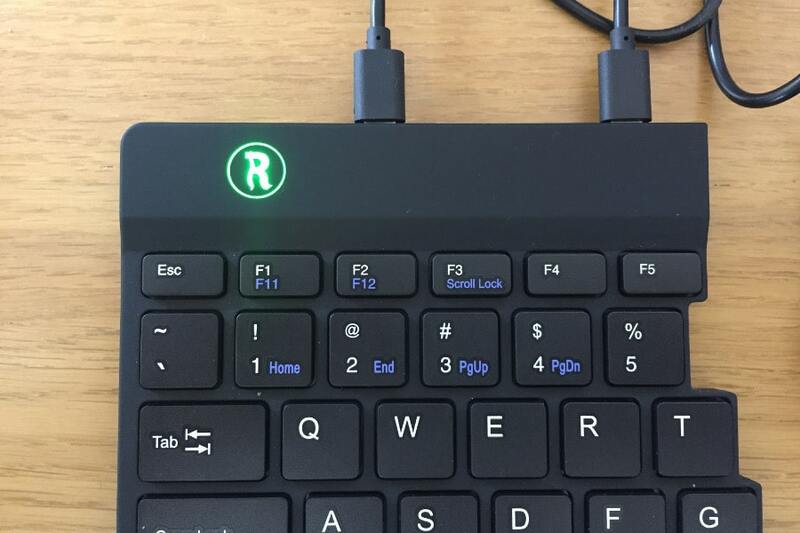 The keys on the R-Go Split aren’t quite at the level of a mechanical key, but still, they have very good responsiveness and a bit of feedback, making typing a nice experience. The build quality is clear with the R-Go Split. Like the HE Break mouse, the material is soft to the touch, solid, and lightweight. It is the perfect mix for a nice, portable keyboard. As mentioned already the keys are responsive and feel extremely durable. 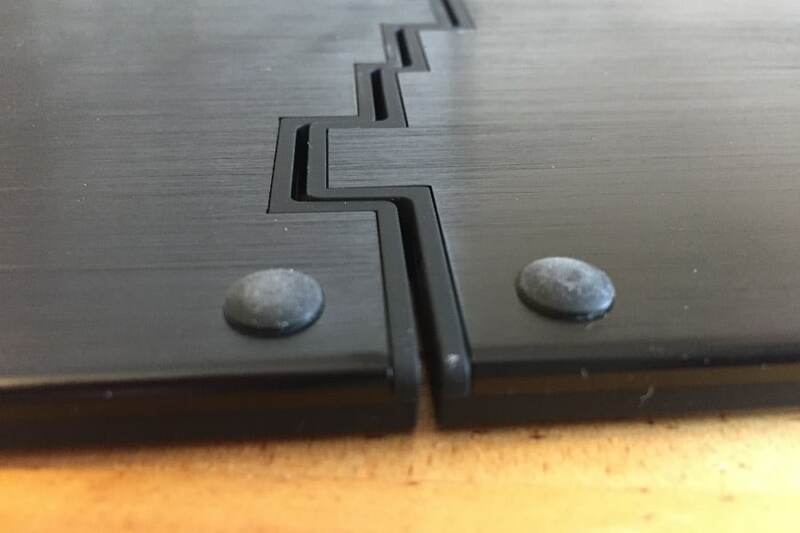 There are also a number of small details that show extreme attention to details which always is appreciated from product designers. Firstly, small rubber feet which protect the base and stop it sliding about. Secondly, a magnetic connector between the two pieces which helps lock it together. Lastly, the beautiful logo light that signals when the product is plugged in and working. The R-Go Split comes with a number of add-ons and options available. Firstly, it comes in US, UK, German, French, Belgian, Nordic, Spanish, or Italian – plenty of options for those who will write in other languages. Secondly, as I mentioned earlier you can add on a number pad to either the left or right side. I have only been using the primary to pieces and using the numbers that run along the top of the keyboard, but if you are required to type numbers all day then I would recommend getting a number pad. What’s more, because of the extra posts you can set it up on the opposite side of the keyboard as your mouse – something a fixed keyboard doesn’t allow you to do. 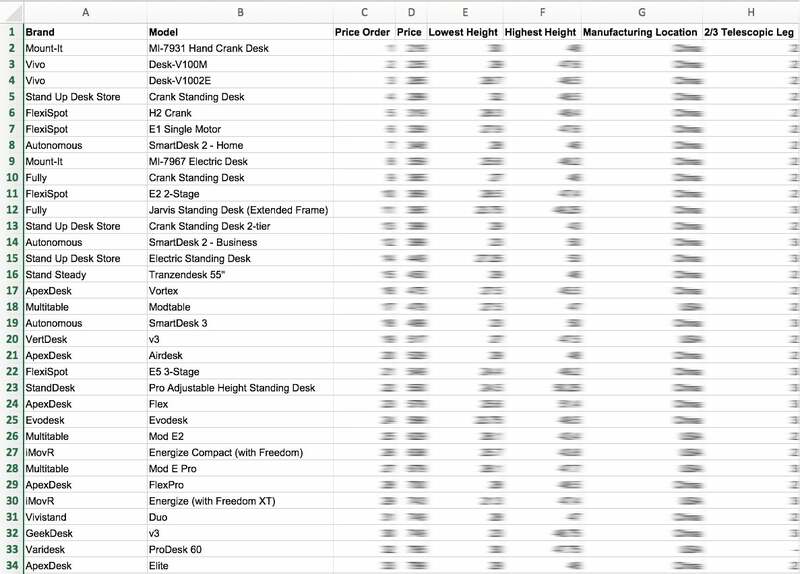 This keyboard only weighs 10.4 ounces and is 11.3″ x 5.4″ x 0.4″. it is probably one of the most portable keyboards on the market, and when you stack the pieces together you can make it even smaller. The only improvement that could be made here I think is that I would personally love to have a small sleeve or bag that the keyboard fits for when traveling. I think the product is sturdy enough to withstand a few bumps and scratches, but a small sleeve would be a nice addition. One thing to be aware of when you first get a split keyboard is the learning curve. This is not something specific to the R-Go Split, but a general problem with split keyboards. I have never been the best typist and would often switch hands and fingers to type keys which should be typed with the other hand. With the split keys, you are forced to type perfectly which can be something to get used to. I must admit the first day was a struggle, but once I got used to it I was actually quite thankful that I was not allowed to be lazy and type incorrectly. One issue I did notice was with a minor key issue. This is more of a small inconvenience rather than a ‘con’ of the product, but I do think it is worth addressing. This issue is also only a problem on Mac, not on Windows. Given the split of the keyboard, there is a shift key on the left side and the right. To capitalize a letter on the left, you must use the left shift key, and vice versa for the right side. 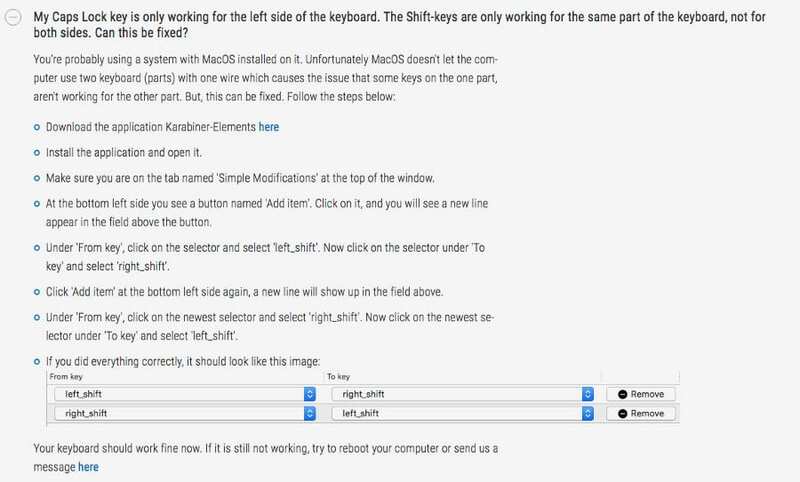 This means that you are not able to push the shift on one side and the letter on the other, it simply won’t work unless you employ the fix below. I’m really happy so far with the R-Go Split. As someone with wider shoulders, I feel like my shoulders are more open and less internally rotated as I work, and my wrists are feeling the benefits of not being so pronated. Although it took a couple of days to get used to a new split keyboard, once you overcome the learning curve you can begin to fully experience the benefits. I’m going to continue to use the product for a long period and time will tell how the benefits begin to affect my wrist and shoulders in the long-term.